Class of 2020: Who Owns the Ice House? An entrepreneurial mindset can empower ordinary people to accomplish extraordinary things. Pulitzer nominee Clifton Taulbert explains the secrets of the “entrepreneurial mindset” that he learned from his Uncle Cleve, outlining eight life lessons that can help anyone achieve success. Read this Forbes article for more information about the entrepreneurial mindset. 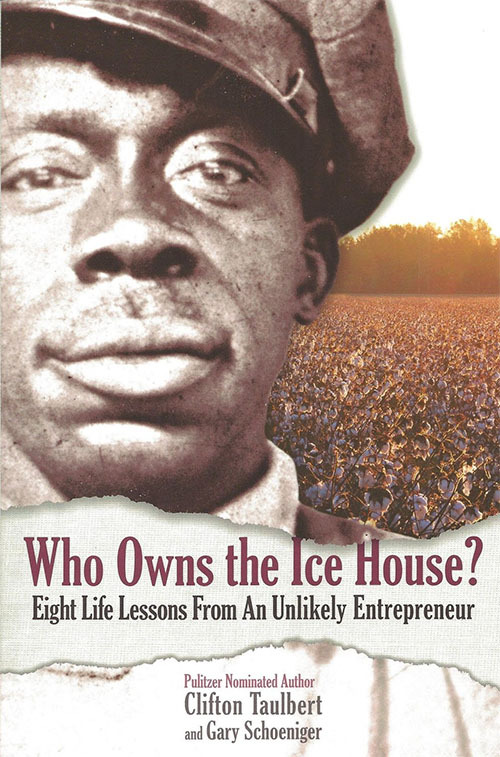 Why Read Who Owns the Ice House? As students begin planning their senior projects during their junior year, we hope that the book’s message will inspire and empower students to challenge themselves! The senior project isn’t just a graduation requirement...it’s an opportunity for all students to achieve something meaningful: to attain personal goals, learn new skills, or solve a problem in their community...and the entrepreneurial mindset described in Who Owns the Ice House provides the perfect roadmap for imagining and achieving great things! To see some of the amazing things Helix students have accomplished for their senior projects, click here! Need an idea for your senior project? Want to help someone out, but not sure how? Check out these ideas from the Helix community. To read more about the senior project and what it involves, check out the senior project web page. Can I keep my book? Unfortunately, no. All One Book, One Helix books belong to Helix Charter High School. You will be required to return your book on the designated return day. Can I write in my book? No, you may not. Because these books belong to Helix and we would like to use them again, please do not write in your book. If you want to take notes, highlight quotes, or use other active reading strategies, please use sticky notes, index cards, or other non-permanent devices to do so. Will I be graded on Who Owns the Ice House? All students are expected to read the book and complete the Summer Assignment, which will be due by Advisory class on August 15th. In what context is the author writing? What is the author’s background? What makes him credible? What is the author’s purpose for writing this book? What are the author’s most compelling arguments or evidence? I am confused about an assignment or the book itself. Where can I ask questions? Please refer any questions to Christina Potter ([email protected]) or Aleen Jendian ([email protected]). What if I have lost my copy of the Who Owns the Ice House book? Please contact the school librarian, Christina Potter ([email protected]) in the case of a missing or lost book. Where can I find more about the entrepreneurial mindset? All incoming Juniors are expected to submit their Summer Assignment by Advisory class on Wed. August 15th. Complete instructions, including examples and all necessary materials, are below. Think about how you can apply an “entrepreneurial mindset” to your own life. What could you do, for a senior project, that would help you create something amazing, learn a new skill, or benefit your community? Having an entrepreneurial mindset isn’t just about starting a business, or coming up with a new product or service. It’s about recognizing opportunity, setting goals, and taking the necessary steps to achieve success. This is exactly what the Helix Senior Project is all about. Your senior project is your chance to make something happen. To do or learn or make something YOU want to do. To pursue an interest, take a step toward your future goals, or help solve a problem you’ve seen in your community. Now that you’ve read about the “entrepreneurial mindset” that’s allowed Uncle Cleve, Clifton, and countless others to reach their goals and achieve success, take some time to reflect on how you can apply this mindset to your own life. On your copy of the document, answer the following questions. Your responses don’t need to be long, but they should be thoughtful. Click here to open the reflection template. Let the Ice House be your inspiration - what could you do with the opportunity of your senior project? Looking for senior project ideas? Check out these suggestions from members of the Helix community and this video for advice from this year's seniors. How can you use this opportunity to make a difference, or to advance your future goals? Can't see the Google Form? click here. We have listed links to videos, articles, and blogs to help you better understand the book.